A cheetah emerging from a fire-ravaged landscape has won a UK photographer the European Wildlife Photographer of the Year 2010 title. 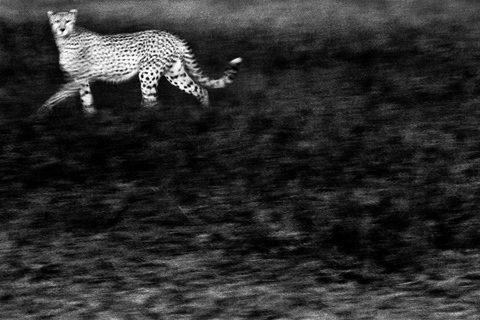 Britta Jaschinski, who is based in London, triumphed with a black & white image of a cheetah – beating more than 11,000 other entries from amateur and professional photographers. She took the photo in Tanzania where a bushfire had destroyed much of the region. ?Suddenly a cheetah appeared on the charred savannah,? said Britta. ?The fires should have been a stroke of luck for the big cats ? where confused prey were deprived of their cover. ?But the cheetah too seemed restless and uprooted. Almost ghostlike. ?I took the picture and watched as the animal slowly disappeared ?? Britta became the first female photographer to win the title in the competition?s ten-year history. She won ?2,000 worth of prize money in the Canon-sponsored contest which was organised by the Society of German Nature Photographers.